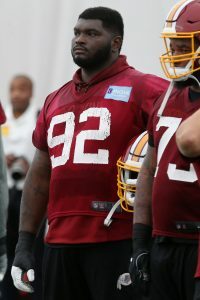 Redskins defensive lineman Stacy McGee and Lions wide receiver Andy Jones, both of whom are currently on the physically unable to perform list, returned to practice on Wednesday, according to veteran NFL reporter Howard Balzer (Twitter link). NFL players on the physically unable to perform (PUP) list must miss at least the first six weeks of the regular season, so McGee and Jones have already fulfilled that requirement. Now that they’ve returned to practice, Washington and Detroit both have a three-week window during which it can decide to either activate McGee and Jones to its respective 53-man rosters, or keep them on the PUP list for the rest of 2018 campaign. McGee joined the Redskins on a five-year, $25MM contract last spring and appeared in all 16 games (10 starts) for the club in 2017, managing 44 tackles in the process. He underwent surgery on his thigh in June, and had been fully expected to miss time as he recovers. When he does see the field, McGee will join a Washington defensive line depth chart that also includes Jonathan Allen, Da’Ron Payne, Matt Ioannidis, Tim Settle, and Caleb Brantley. Jones, 24, went undrafted out of Jacksonville University in 2016, and originally latched on with the Cowboys. He spent the entirety of his rookie season on Dallas’ practice squad before being cut in advance of the 2017 season. He was claimed off waivers by the Texans, but appeared in just one game before being waived yet again. Jones was on the Lions’ practice squad from September onward, until getting promoted to the active roster for three games in December.